“You’re revising it? I thought you just send them the book?” a fellow American writer in Borneo replied a year ago, when I mentioned that I would be busy the next two weeks revising all the stories for Lovers and Strangers Revisited. I had just told him that it was confirmed that Éditions GOPE will be translating my collection of Malaysian-set stories into French. “Yeah, you could do that,” I could’ve replied, but instead, I told him that I saw this as an opportunity to improve the stories for future markets. I want the best French translation out there and the best English version, too. Now that I’m getting the book into Europe, other readers might recommend it to other foreign-language publishers in nearby countries, especially those with an interest in or ties to Malaysia or Southeast Asia. Writing from Borneo (or anywhere) is never a straight path to publication; it’s more serpen­tine like a meandering river through the lush tropical jungle, often invisible at times and then there it is. Just as quickly it’s gone, elusive as a pesky mosquito that you have in your sights just as it’s about to draw blood. You strike, positive you got it, but then, how in the world did you let that opportunity get away? When it comes to writing, I’d rather not miss those opportunities, so I keep revising those stories. Twenty-five years ago, I took my writing itch from Madison, Wisconsin to the tropical island of Penang, off the west coast of Malaysia. “Mat Salleh”, a short story about meeting my non-English-speaking-in-laws in Malaysia that I wrote for a correspon­dence course quickly found a home in the New Straits Times. I sold it again a few months later to My Weekly in the UK, for my second short story sale and second overseas publication. I knew I was onto something. In addition to selling more short stories in Malaysia, I sold stories to literary journals and magazines in Singapore, Japan, France, Denmark, India, Australia and United States. In 1993 I compiled 15 of my Malaysian-set short stories into a collection, Lovers and Strangers for a Singapore based publisher Heinemann Asia. A few years later the publisher was bought out and then another publisher bought that one out and my collection was orphaned. I con­tinued to revise my stories, selling them locally in Malaysia/Singapore as well as overseas, mostly in Australia and the UK. In 2005 a Malaysian professor contacted me about including the collection in his course on postcolonial writing, so I convinced Silverfish, a Malaysian publisher whom I had pre­vious­ly worked with as an editor for an anthology, to republish the stories—but first I wanted to overhaul them. I knew I could make the stories better than merely revising them as I had been doing all along over the years. So I hired an American editor living in Malaysia to rip them apart, even though all but one had been published. Many of the stories had been published several times in several countries. It was a humbling process. I then revisited each story—from the initial inspiration to some of the original settings—and renamed the collec­tion Lovers and Strangers Revisited. Then one of the stories "Neighbours" was taught throughout Malaysia in English Literature as part of the "sixth cycle". After moving to Sarawak, the Malaysian part of Borneo, I encountered some distribu­tion problems getting the books to the Borneo bookstores, so I agreed to buy out the last of the old stock and switched publishers. Thus began another round of self-editing before submit­ting the collection with an additional two more stories written around the same time to be published for the third time by MPH in 2008. When someone blogged about the fact that I revised my published stories, several writers seemed to take offense. One author from Australia said she would never do that with her collection, but after I clarified my reasons, she added that she sort of wished she had done the same because she knew she could’ve improved them. For me, that first collection back in 1993 was the best version—at the time. But after teaching creating writing and grammar for over a decade, plus revising all of my students work (and my own), I became a better writer. Now it was merely applying what I was teach­ing and being honest with myself. Is that the best you can do? I felt vindicated when the collec­tion went on to win the 2009 Popular-Reader’s Choice Award for Fiction. To help publicize the latest collection, I wrote a blog series The Story Behind the Story for all 17 stories, separating fact from fiction and noting the significant changes that led to their various publications. While making comparisons between the first collection and the latest collec­tion, I was surprised by how much the stories had truly evolved. It’s not just the details, the preciseness of language, but significant changes in the beginnings and endings; changes in points of view; and changes in verb tenses from past to present . . . . Some of the stories doubled in length; they had whole new scenes added on at the end, or back-stories weaved throughout the story to make them more complete. The first blog on the story “On Fridays” has been even accepted for publication by The Writer (USA) as a future Writer-at-Work piece. The revisited stories (and even the accompanying blogs) have been taught in secondary schools, universities and private colleges throughout Malaysia. Several stories have since been published in online literary journals in Hong Kong and Turkey; and in the Literary Review, Thema, and Aim in the US and Descant in Canada—twenty years after I first wrote them. So far those 17 short stories have now been published 81 times in twelve countries. 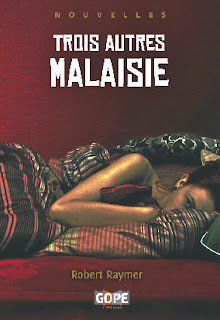 Then in 2011 the French publisher GOPE contacted me; after reading two of my stories online, the collection has now been translated into French as Trois autres Malaisie, which literally translates as "Three Other Malaysia". Reviews are just starting to come in. This may never have happened had I not left the wintry (and freezing) Wisconsin for the tropical (and humid) Malaysia. I figured, even if I never published a story, I wouldn’t be shoveling any snow. Writing from the tropics does have its benefits, though I won’t mention the mosquitoes . . . . And who knows where my stories—after having gone French via Borneo—will end up next? Now it’s just been confirmed, MPH is turning Lovers and Strangers Revisited into an e-book! That means another round of editing (plus adding those French revisions back into the MPH book). Already Ohio University has contacted me about filming “Home for Hari Raya”. They came across that old 1993 collection in their library and were initially interested in “Mat Salleh”, but after talking on the phone and sending them a copy of the latest collection, they settled on “Home for Hari Raya.” A couple of those stories may be taught by another professor in their Southeast Asia Studies program. Ultimately this could lead the whole collection on a homeward journey to the US, which is why I keep revising those stories. . . . I want them to be more than ready. I’m also hoping this serpentine road from Borneo never ends . . .